This morning there was a gleam of sunshine and a suggestion of colour in the sea – but too little, too late, because we were leaving Turtle Bay, and Oahu. It’s not that far back to Honolulu, only an hour’s drive or so from the (usually) rampaging surf of the north to the tame beaches of the south. We left hopeful surfers sitting on their boards out from the beach where the Pipeline should have been powering in, but wasn’t. The results board for the Triple Crown stood still empty, the rectangle awaiting the name of the eager winner of the $100,000 grand prize far from being filled in. From there to the bustling tension of Honolulu Airport was more than just miles – from laid-back freedom to rules and bossiness and no personal rights. But the flight to Molokai was blissfully short, and the atmosphere quite different, much more Pacific: a bit ramshackle, lots of turquoise paint, no crowds, lots of space, and clearly its own time-zone. We took a drive to the end of the road, eastwards, 28 miles to the wild, verdant and steep Halawa Valley, along a route that skirted the coast with its ancient rock fish pools, cattle with egrets sitting on their backs, quaint little churches including the one dedicated to St Damien (more on him tomorrow), taro plots and rivers. The road wound, climbed, dropped, got more and more narrow, with hangovers and drop-offs, rock fall warnings and oddly stilted warnings reading Limited Sight Direction. It was white-knuckle stuff in parts, especially after the road became a single lane for the last section; and eventually stopped dead at a gate and a sign saying End of State Highway – beyond lay a dirt track to the beach. So we retraced our route, rewarded by a remarkably intense and fast sunset, barely 15 minutes from go to whoa. The disaster of dinner was mitigated somewhat by our being whisked back into town to Kanemitsu's Bakery, along a dark alley to a window where we tried out the Molokai Hot Bread speciality: an oven-warm flat loaf of soft bread, split and filled with any combination of butter, cinnamon, cream cheese, blueberry and/or strawberry. 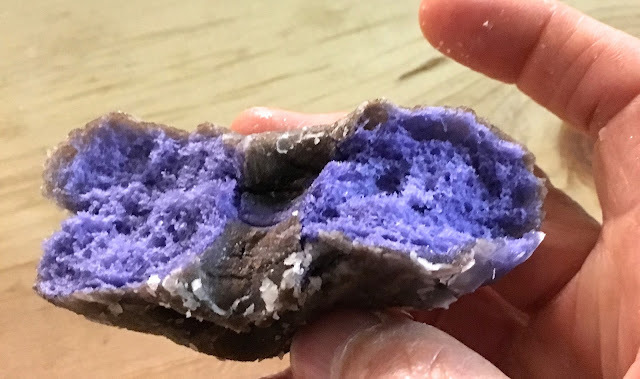 It was pretty good – not quite so sure about the sugar-glazed, luridly purple taro donut, which had a peculiar aftertaste. It’s meant to be very good for diabetes, apparently, which is kind of neat: problem and solution in the one package.